Photo: Pool/Tim de Waele/Getty Images (File). Wednesday's Dwars door Vlaanderen should be a wide-open opportunity for riders who usually live in the shadows of Flanders favorites. With more than a few of the big Tour of Flanders favorites passing on Wednesday’s 74th Dwars door Vlaanderen, the mid-week classic should be a dogfight for the leftovers. The 179km race starts in Roeselare and ends in Waregem, with 11 climbs and four sectors of cobbles along the way. Most editions feature a reduced bunch sprint, with the Knokteberg at 113km a key climb. Forecasters are calling for cooler temperatures and a chance of afternoon showers. Last year’s race was held in a tempest, with Yves Lampaert winning out of a reduced bunch to defend his title. 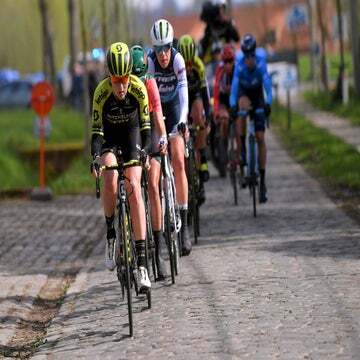 Since its upgrade to WorldTour status, the race moved into its current slot between Gent-Wevelgem and the Ronde van Vlaanderen. That’s upped the prestige, but it also means a few top names steer clear of its challenge. With so much on the line Sunday at the Ronde van Vlaanderen, several of the top-line favorites are not starting. 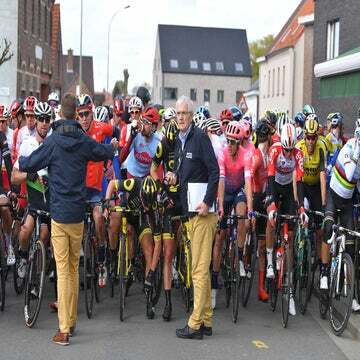 Greg Van Avermaet (CCC Team), Peter Sagan (Bora-Hansgrohe), Zdenek Stybar (Deceuninck-Quick-Step) and Wout van Aert (Visma-Jumbo) are all skipping Dwars after a hard-fought E3 BinckBank Classic and Gent-Wevelgem to be as fresh as possible for the demands of the Ronde. That should mean it will be a tug-of-war between other top stars as chances to win a major Flemish classic decrease with the passing of each day. Even without Stybar, Deceuninck-Quick-Step will still line up with a powerful team anchored by two-time defending champion Lampaert and Philippe Gilbert. 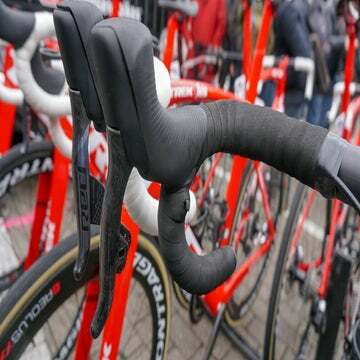 Other favorites will include Oliver Naesen (Ag2r La Mondiale), Niki Terpstra (Direct Energie), Tiesj Benoot (Lotto-Soudal), Gent-Wevelgem winner Alexander Kristoff and Fernando Gaviria (UAE Team Emirates), and Jasper Stuyven (Trek-Segafredo). Another name to watch is world cyclocross champion Mathieu van der Poel (Correnden-Circus), hot off his impressive fourth-place WorldTour debut at Gent-Wevelgem on Sunday. Also, reigning world road champion Alejandro Valverde (Movistar) returns, following his 11th-place debut last year on the pavé. Valverde will use Wednesday as a warm-up ahead of his first career start in Sunday’s Tour of Flanders. Another rider whose Flanders fate hangs in the balance is Sep Vanmarcke (EF Education First), who crashed into a ditch during Harelbeke on Friday and injured a knee. Team officials said Vanmarcke would not race Wednesday and might not be able to start the Ronde. A decision will likely not be made until Saturday. EF Education First will likely see Taylor Phinney return to racing Wednesday after he sat out Harelbeke and Gent-Wevelgem to rest a sore right knee. Alberto Bettiol and Sebastian Langeveld also race Wednesday. So who will win? A lot depends on the weather, but Quick-Step will be trying to swarm the peloton. An on-form rider like Naesen or UAE Team Emirates’s Kristoff could tip the apple cart, carrying speed out of a reduced bunch.